He may have agreed to take her for better and for worse, but for one Algerian groom, seeing his new wife without make-up was a step too far. 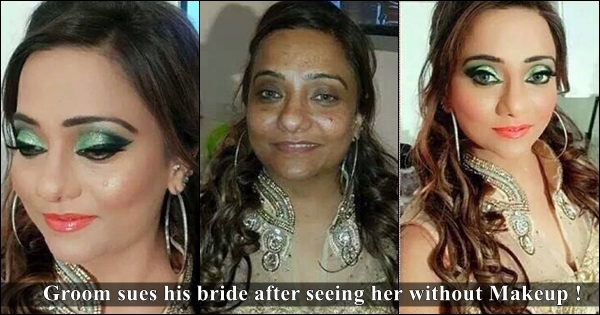 The husband was so shocked after seeing his bride’s face the morning after their wedding that he failed to even recognise her. He even accused her of being a thief that had broken into his house. After realising it was in fact the woman he had married the previous day, he decided to take her to court – accusing her inflicting ‘psychological suffering’ by ‘cheating’ him with her make-up. The groom is now seeking $20,000 (£13,000) damages. Newspapers in the North African Arab country said the groom swore in court that he even mistook his wife for a “thief who came to steal his apartment”, Emirates 24/7 reports. He said he was deceived by her as she used to fill up her face with make up before their marriage, the papers said, quoting a court source. He said she looked very beautiful and attractive before marriage, but when he woke up in the morning and found that she had washed the make-up off her face, he was frightened as he thought she was a thief.